Last month I wiped out my Nikon camera while rescuing another kayaker. Got another camera and bought the Aquapac Small Camera Case with a hard lens cover. 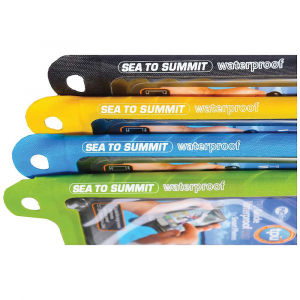 The case is waterproof and has a 5 year warranty. My Lumix camera fits inside and when the zoom lens extends, it's protected by the attached lens cover. Works perfectly and the case IS waterproof..I used it to take pictures while teaching a kayak class...thru capsizes, re-entries, without a drop of water getting in the case. The picture above is for the small camera case NOT the case with a hard lens. The best feature is that the case is waterproof. Second, it allows very clear photos to be taken thru the lens housing. The case is of very tough plastic but flexible enough to work the controls of the camera. The only negatives I can think of is that the dessicant packs that come with the camera could open and spill onto your camera...but even they come sealed in a separate plastic bag. 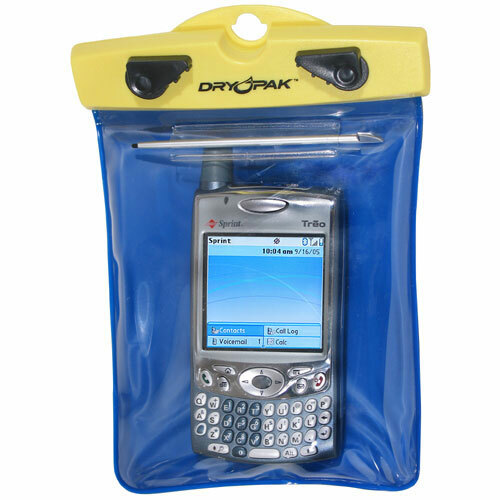 Aquapac makes many waterproof cases for items (various size cameras, phones, tablets, nanos, etc). For small point and shoot cameras, their Small Camera Case works well. My Lumix has a lens that extends about 1 1/2" so I ordered the Aquapac Small Camera Case with Hard Lens. 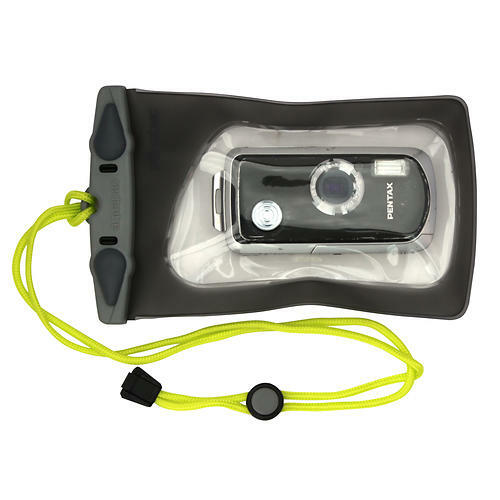 The case is made of a tough clear plastic and has a housing attached via a waterproof seal which allows the lens to fit easily and for photos to be taken through a clear acylic lens cover. The case is sealed by rotating two levers at one end of the case towards the sides of the case, at which point they lock with a pressure fit. 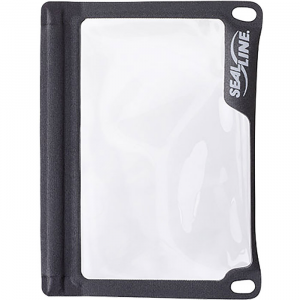 This is a common method of sealing cases and found on a lot of waterproof cases for VHF radios, GPS's and such. It is very effective. The plastic is flexible enough that you can operate the controls of your camera, though it make take some practice to line up the lens with the lens housing and use the zoom. 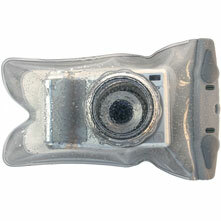 Once the camera is on, the extended lens will stay within the housing and lets you zoom in or out quickly. It's not the same as having a $200 external housing made specifically for your camera, but the Aquapac case does work and protects your camera. There is a 5-year warranty on the case, however this does not cover the value of the contents. I've used my case when teaching kayak classes...capsizing and doing rescues and had no problem with the case remaining waterproof. I do pay attention to not let anything scratch the surface of the lens housing as that will affect any photos taken thru the lens cover. One point to note is to make sure to not extend your camera lens TOO far as it can scratch the inside of plastic lens on the waterproof case. Adding a thin shim of plastic to the front of the camera lens housing handles this). Yes...this is hindsight speaking as I managed to scratch the Aquapac lens and had to buff it out. A shim makes more sense. Additionally, I read one review where a bag of the dessicant powder that comes with the case opened up and wrecked one persons camera...the dessicant comes contained in a separate sealable bag so it shouldn't be a problem if used properly. Overall, I'm very pleased with the product. I paid about $45 for the Hard lens case after looking around on the net. Prices ranged from $45-65. I saw a number of cheaper cases but without the same type of closures and without warrenty. Those weren't worth it to me. 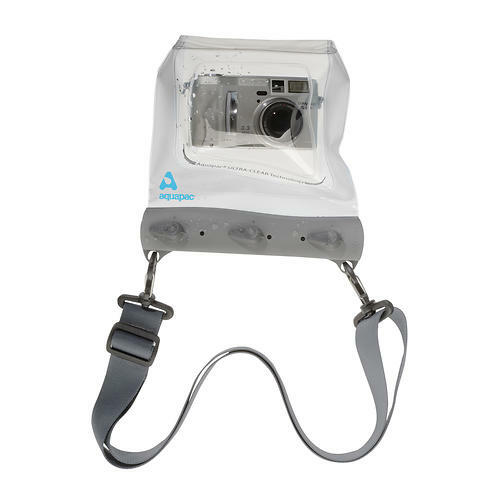 NOTE: there is a difference between the Aquapac Small Camera Case (which is pictured) and the Small Camera Case with Hard Lens which is what I reviewed, and also costs more. 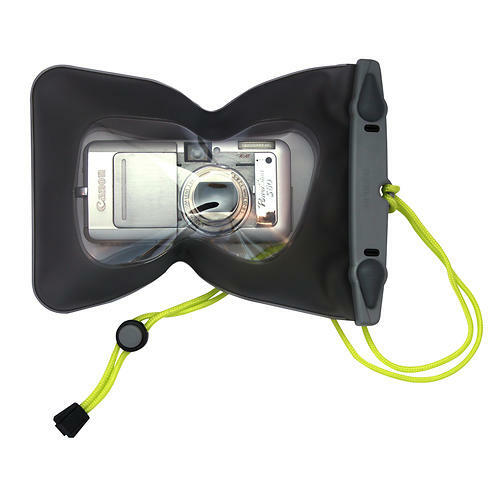 The Aquapac Mini Camera Case with Hard Lens is not available from the stores we monitor. It was last seen August 9, 2018	at SunnySports.